Rather than return the way I had come, I had decided to climb up the valley and over the ridge, via a route that was new to me. I was gripped by excitement and anxiety. From the village, perched high above the river, we make our way down into the gorges. The wind is blowing and rain coming down. On the narrow slippery path that wound between the cliffs and rises, Damene stpos me. Below us, straddling the river, he points out the passam. I have already crossed a few, on my journey here. They are beautiful, impressive, simple bridges suspended on three ropes as thick as your arm plaited from mountain bamboo split along its length to draw its fibres. The climb down is often slippery and giddying. The climb up, exhausting. You have to keep your feet on the rope reinforced with branches while the whole structure sways as though alive. You hang on, your hands gripping the two other lateral ropes, looking down while trying not to let yourself be hypnotised by the current flowing ten or twenty metres below. A formidable current that rumbles and rushes, washing the melted snow from the Himalayas, its fury taking it on a long appeasing journey across the Southernplains to feed the river of all rivers, the Ganges, before disappearing into the Indian Ocean. The river is now almost directly beneath the pass. Swollen by recent rain, it rages downwards in torrents. The water is grey and muddy. Is it the extraordinary view before me, or is it weariness, or simply fear, that prevents me from crossing this outlandish construction straight away ? A mixture of all of them, no doubt. I stop and ask my two companions to wait for me on the other side. Beneath the soft rain, I wedge my rucksack between the rocks to create a base for my Leica. When I set my eye to the viewfinder, my heart leaps. I need a 180mmm lens rather than the 60. 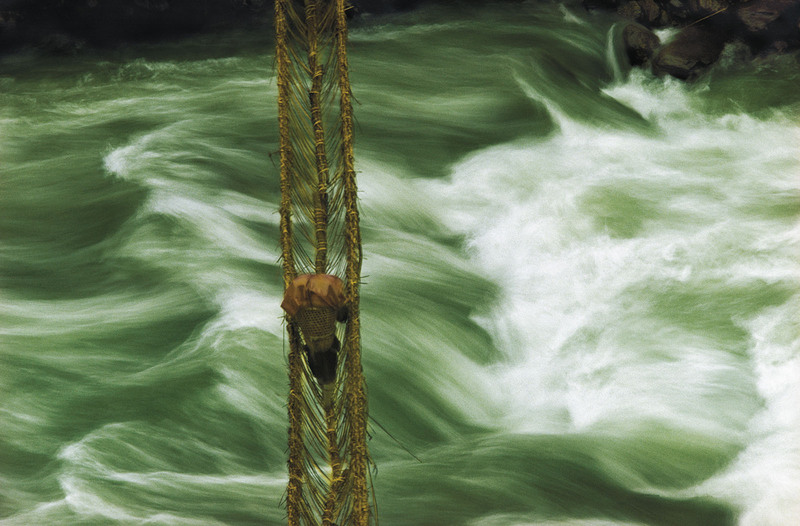 I frame the fragile structure against the raging current. Damene starts to cross. I close the f-stop as far as it will go and consequently the shutter speed slows down. Damene, pausing for a rest or because he too is impressed by the sight, freezes in the middle, just before the climb which the rain makes even trickier as the plaited bamboo fibres, full of water, are slippery. The bridge stops swinging. Stillness, suspended above the raging waters, the fragility of man and his edifice in the presence of nature’s power…..A moment of pure magic. I click. Damene continues his journey. It is late. I have to follow him, also cross the passam. Tonight, we will sleep in the forest. There is a cave along the way. I spent several days in the hamlet of Pilling, a collection of twenty or so huts lost at the bottom of the valley among the forests and mountains, in the company of an elderly gentleman. The I left. Along the way, I was obsessed by the vision of the bridge. What would my photos give? Had I taken enough (only 6 or 7!)? And what about the idea of slowing the shutter speed…..? Fifteen days later, I was in Katmandu, then France where, feverishly, I inspected my films on the lightbox when I realized that the one with the bridge and several others of the village had disappeared. I rummaged through my bags but to no avail. Where were they? How could I find out? I had to face fact: those several rolls that I was so immpatient to see were definitively lost. The image of the bridge and my frustration haunted me for months. Then, gradually, I forgot about it. The following year, I returned to the Tsangbou where I nearly died of typhoid. Two years later, I would return there again. I crossed the same bridge. But, beneath the winter light, the magic had flown away. I didn’t even stop to take a picture. In the next hamlet, I found my host and my small wood bed on which I spread my sleeping bag. After all this time, I was happy to be back in the untouched wilderness again with these men from the end of the world. In the evening, I lit a candle to write my journal when my host came to sit by my side. We get chatting. Two years have gone by since my last visit. People are happy, barter with wood, beams, incense, salt, grain and butter is good. The snow is late. as winter approaches, as usual, the police guards at the check post have gone. one piece of news follows another when suddenly, in the middle of a sentence, the old man stops. » Actually Sahab », he says to me. » Last time you were here you forgot something ». He gets up and picks out a small faded yellow canvas bag that he hands to me. I open it . Inside were half a dozen of those small round black containers, with grey lids. My rolls of film had spent two years, subjected to twowinters and two monsoons in his hut! As soons as I arrived in France, I developed them. The whole series had taken on a strange and wonderful green hue; Among them I found the photo of the bridge That I thought was lost forever.